Processed white breads, baked goods made with butter and large flour tortillas are bread products from the grain group that will quickly add calories to your diet, without giving you a lot of fiber or nutrients. 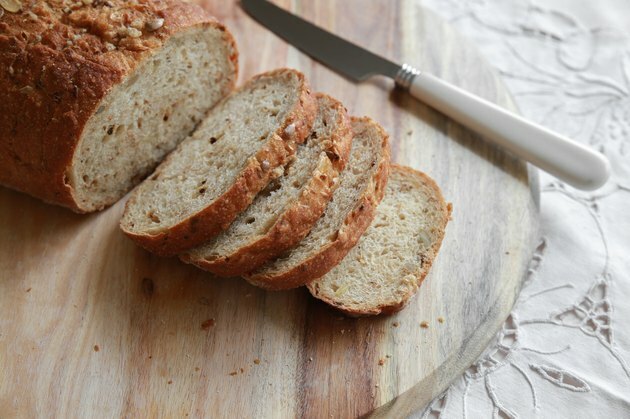 Whole-grain breads, on the other hand, offer fiber and other nutrients that benefit your health. While you can certainly have a serving or two of bread each day, recognize that not all bread products come in the same size. Generally, a single 1-ounce serving of bread is equivalent to one slice, according to the USDA’s ChooseMyPlate.gov. But some bread-related products or bread alternatives are measured a bit differently. For example, an English muffin is actually two servings -- each half is one 1-ounce serving. One of those large bagels, like the ones you’ll find at many coffee shops, amounts to four 1-ounce equivalents. A single serving is one-fourth of a large bagel or one mini bagel. If you prefer biscuits, one portion is a small 2-inch diameter biscuit. If you typically order wraps, you might be getting more servings from the grain group than you may realize. One 12-inch tortillas is equivalent to four 1-ounce servings from the grain group. Make your wrap at home and use a small tortilla instead. A single 1-ounce portion amounts to a 6-inch tortilla. Other bread products, such as pancakes and muffins, also fit into the grain group. Measure the portion size of these products carefully, because some are high in fat and calories. Make whole-wheat pancakes topped with fresh fruit as a high-fiber breakfast alternative to toast. One serving is two 3-inch diameter pancakes. A 1-ounce helping of cornbread is just 2 1/2 inches by 1 1/4 inches and 1 1/4 inches high. A 2 1/2-inch diameter muffin is another baked good that is equal to 1 ounce. But if you have a larger 3 1/2-inch diameter muffin, you’re getting three 1-once equivalents from the same food group. The amount of bread you can have in your daily diet depends on your gender and how many other grain foods you eat. As a woman, you can have three 1-ounce equivalents from the grain group daily. But if you’re male, you’re allowed three to four 1-ounce equivalents. A sandwich with two slices of bread, for example, takes up two 1-ounce equivalents, or more than half of your daily allotment, depending on your gender. If you have a half-cup of cooked oatmeal, rice, pasta or other 1-ounce serving equivalent from the grain group, you could quickly go over the recommendation. Is Toast Good to Eat When You Are Dieting?